So the last few weeks here at Cthulhu Reborn Central have been mostly filled with stuffing envelopes with printed combo packs of Dateline: Lovecraft kits and transporting small mountains of parcels to the post office. We are now mostly done, and dozens of folks in diverse places around the world are now the proud (we hope) owners of genuine replica 1928 Arkham Advertiser broadsheets. However, while we have been busy doing that, in the background we have also been making some progress with new releases for our product lines. I thought now might be a good opportunity to share some news about the next couple of things coming from us. 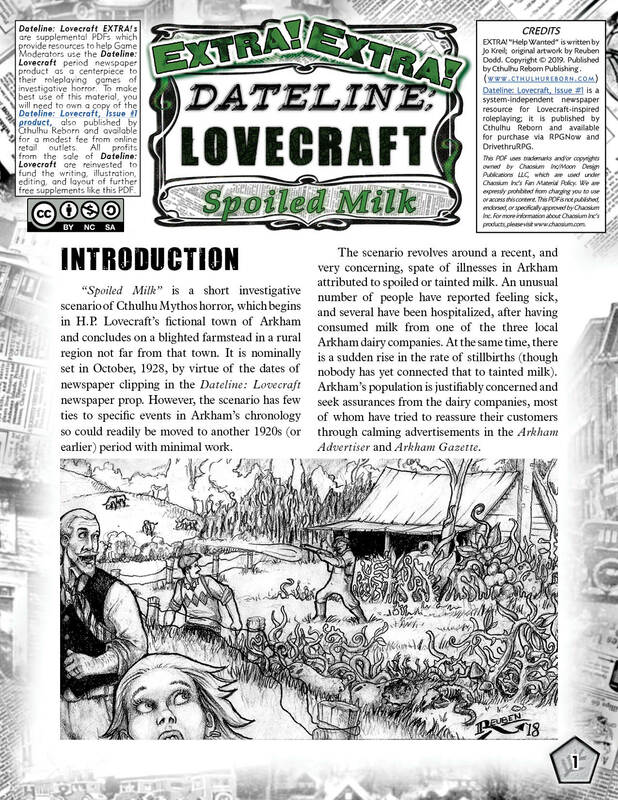 If you’ve spent any time poring through the numerous articles and advertisements in the Dateline newspaper prop, maybe you have noticed the unusual number of references to Arkham’s milk supply, and concerns about tainted milk? Well, Jo certainly did, and she has woven those different mentions into an investigative scenario with three different (but equally nasty) Mythos explanations for exactly what is going on. It’s enough to make you want to give up on dairy forever. It’s been a fortnight since we announced that a small batch of printed Dateline: Lovecraft combo packs (broadsheet newspaper + accompanying softcover book) were available for sale. Since then a lot of people from many corners of the globe have been in touch … and we have mailed off a small mountain of packages. and here’s another seen lurking in the vicinity of YSDC founder-and-operator Paul Maclean. If you are thinking that you would like to get your hands on one of these packs, there are still a few available but they will probably sell out. Looking at the once-full box of broadsheet newspapers, I think there are around 15 copies left. Once they are all gone that will be it for the current print run. We probably will be making more of these … but likely not until the second half of the year. Again, we are selling these for USD 25 plus the cost of shipping. Since they are coming from Australia, the price of shipping to some corners of the globe is more expensive than I would prefer … but right now most orders to the US have a shipping charge of USD 18, orders to the UK have a shipping cost of USD 20, and Western European countries seem to be around the same. If you are interested in grabbing one of these packs, drop me a message via the form immediately below this line! 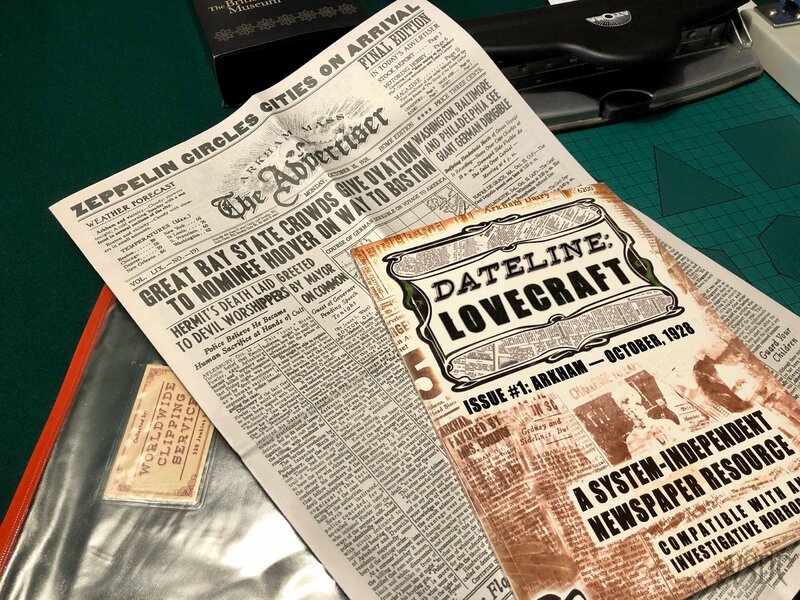 As we mentioned just before Christmas, one exciting project we’ve been pursuing is making a physical printed edition of Dateline: Lovecraft, our newspaper-themed resource for Investigative Lovecraftian horror games. Based on the overwhelming feedback from our earlier blog-poll, we have pushed forwards with the idea of making the Dateline: Lovecraft core physical product a combo pack with newspaper and guidebook. As shown back in December, we had a batch of the broadsheet newspaper printed for us — and now we also have copies of the guidebook in print. The 100-page guidebook reproduces most of the content from the Dateline: Lovecraft PDF but also includes the first two Dateline EXTRAs, Jo Kreil’s “Help Wanted” and Noah Lloyd’s “Smoke Green”. So that means that the book is complete with loads of helpful indices and ideas for using newspapers in your games AND a campaign frame AND three full scenarios! We are still thinking about how we want to make the printed combo sets available for sale longer-term … but for now we have a box full of them that we can sell to our loyal blog readers. For now we are only going to be taking orders until the end of February, or until our first box of books and newspapers runs out. So if you want one, get in quick! To express your interest in buying one of these combo sets, use the form below. For blog readers we are pricing the sets at USD25 plus the cost of our postage. When you fill out the form, we’ll get back to you with the final cost inclusive of postage — but we already know that international postage is going to sting a little. For shipments to the USA we’re expecting the shipping cost to be about USD 18; for shipments to the UK it will be about USD 20. Shipments to Australia will be a lot less, though. We’re quite excited to be able to get print copies of our newspaper out for people to use in their games — to cut into ribbons, bamboozle players, or use as makeshift bedding for your hobo Investigator! So, it’s the last day of 2018 … and it seems fitting to do a round-up of everything that we’ve released this year (just in case you have missed something). But before we do that, it’s probably fitting that we confirm our next release. Thanks to some generous donors over the Christmas break (who dropped by our donate page and sent some Xmas cheer our way), we have now reached the threshold where we can afford to release the second free/PWYW add-on for Dateline: Lovecraft. That will be Noah Lloyd’s excellent scenario “Smoke Green”, and should be out sometime in January. We are very grateful for the kind support of our donors! Now … on to the review of 2018 releases. This year we were able to put out *eight* titles, which is one more than in 2017. Five of the releases were for Convicts & Cthulhu; the other three being somehow related to Dateline: Lovecraft. 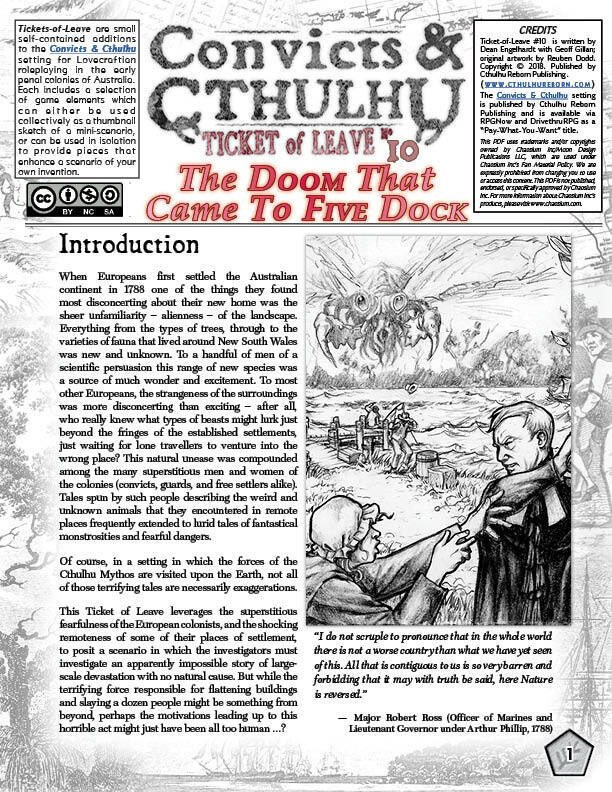 In February we released the tenth in our “Ticket of Leave” series for C&C, sub-titled “The Doom That Came To Five Dock.” That supplement was a scenario-only release (although sticking to the familiar format of multiple Cthulhu Mythos connections from which the GM can choose). It revolves around a terrifying encounter with a most peculiar horror, which has all-but-flattened a small outlying ferry way-station along the Parramatta River. It also features one of my favourite Reuben Dodd pictures so far, depicting a bizarre and enormous insectoid terror silently approaching an unsuspecting group of convict women. 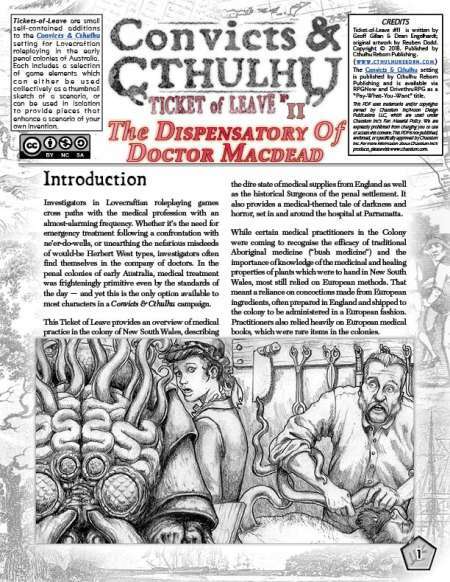 May saw the release of Ticket of Leave #11, subtitled “The Dispensatory of Doctor MacDead”. Geoff had an idea to produce a supplement about the rather primitive state of medical practice in the early penal colonies. On researching further, we discovered that historically, things were far more shonky than even we imagined. Not only was the availability of medical supplies extremely limited, but there was a definite shortage of trained people. This was compounded by the fact that *anyone* could claim to practice medicine, without having to present any qualifications or evidence of training. That formed the basis for the scenario at the core of this release, which featured a “medical man” of dubious background and a trail of Mythos-related mayhem left in his wake. Curiously, the surname “MacDead” isn’t something we made up (although it is quite apt here). There really was at least one convict of that name transported to the Australian colonies! In June, we celebrated a brand new writer joining the Convicts & Cthulhu fold, Matthew Ruane. Matt has long been a supporter of ours and when he suggested an idea for a C&C scenario we invited him to pitch it as a “Ticket of Leave.” This became Ticket of Leave #12, subtitled “Fallen Stars.” Matt’s scenario features a very classic Lovecraftian RPG kind of set-up — the Investigators are summoned by the authorities to look into reports that a meteorite that blazed across the night sky of Sydney later fell to earth in a remote region at the foothills of the Blue Mountains. In the C&C period, this is a largely-unexplored part of the colony, so the trek out is a rather serious undertaking. What the expedition finds at the crash site, though, elevates it to a much more perilous — perhaps even otherworldly — exercise in survival horror. Matt also ran two sessions of this scenario at GenCon Indy, and was kind enough to write-up a detailed account of how the different groups went. 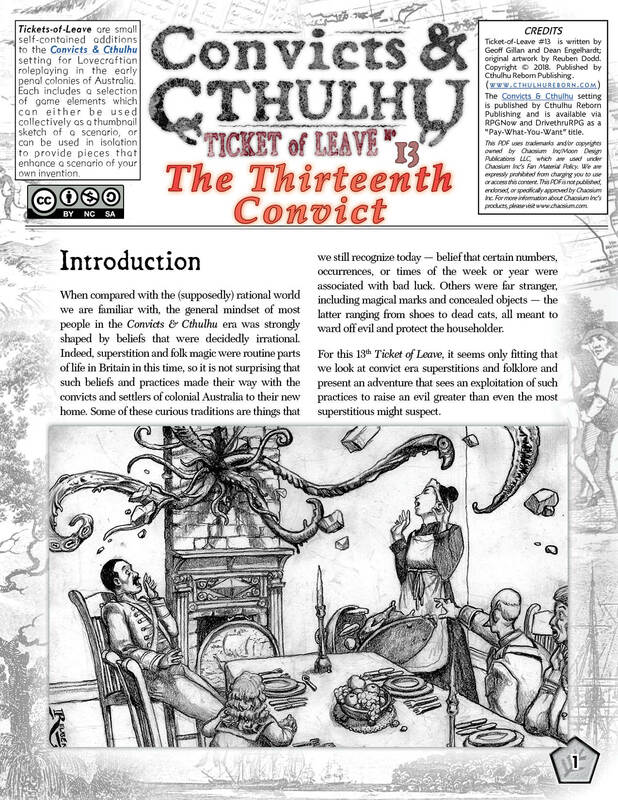 Because our time was consumed with launching Dateline: Lovecraft, the C&C line took a bit of a hiatus in the middle of the year, but we returned in October with Ticket of Leave #13, subtitled “The Thirteenth Convict.” The theme for this release was folk-magic and superstitions of the early settlers and convicts in Australia. This is both something that Geoff had mentioned as a topic ripe for C&C, and also something that was suggested to us by readers after a few media articles were published about new discoveries of “witch marks” and similar signs in surviving colonial-era structures. The scenario-part of this release took on a bit of a life of its own, and snowballed into more of a campaign. The size of this beast was a big factor in this being our largest supplement for C&C to date (at 27 pages). Finally, in December we released our most recent C&C title. This launched a new format of supplements — the so-called C&C Muster. These are designed to focus in on a single historical character and provide a wealth of ideas about weaving their unique (and usually grubby) real-world backstory into a game. 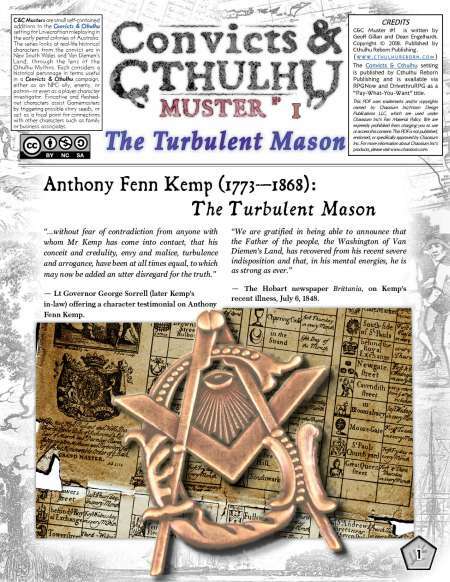 C&C Muster #1 was subtitled “The Turbulent Mason” and describes the life and times of a curious character named Anthony Fenn Kemp. 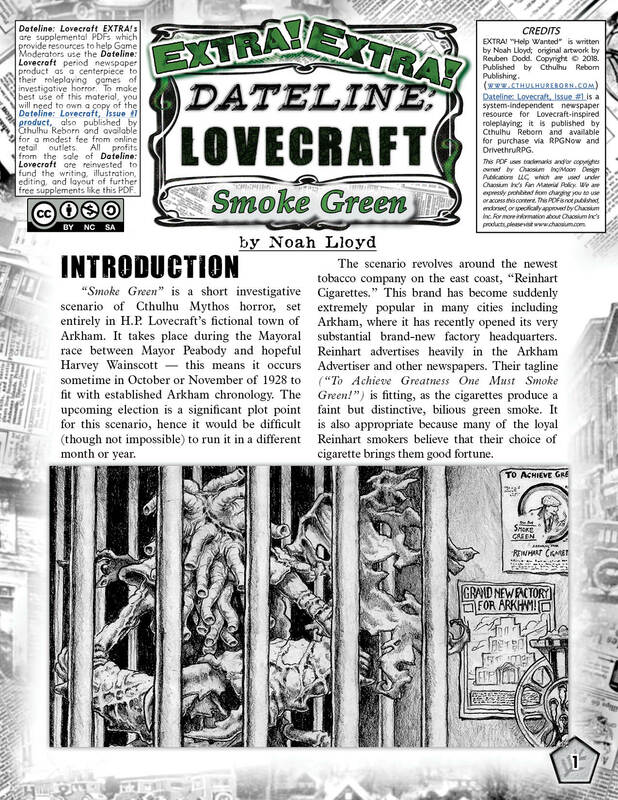 We announced the existence of Dateline: Lovecraft — our Arkham-1920s Newspaper-themed product — back in August. The core concept revolves around a very large newspaper prop — a broadsheet copy of the full edition of the Arkham Advertiser for the day of October 15, 1928. The idea is that this hugely-detailed “handout” had buried within its mundane news and advertisements, a large number of “weird” hooks or details that a GM could use to spin off a new scenario or weave into a pre-existing scenario to offer extra colour or weirdness. 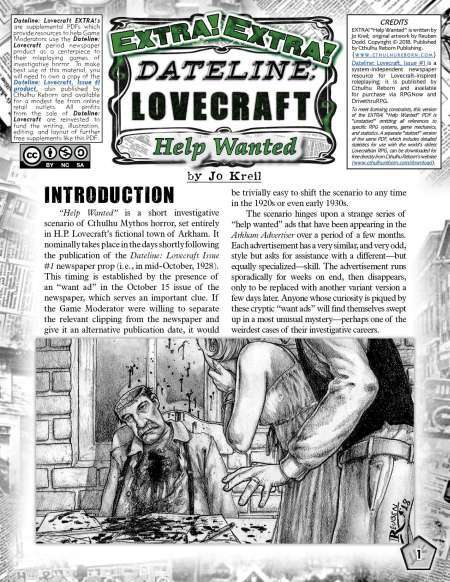 The Dateline: Lovecraft core product comes with a guidebook that not only provides extensive indices to help locate stray details in the 40,000 words of newspaper content, but also provides ideas for different ways of exploiting it to weird effect. There’s also a campaign frame and a full scenario (written in a system-indpendent form). 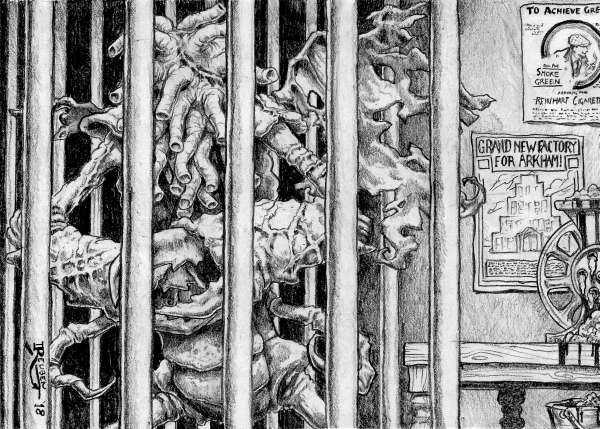 During the development of Dateline: Lovecraft, we went back and took a very detailed look at Keith Herber’s game depiction of Arkham (first published as Arkham Unveiled in the 1990s). The reason for this is that we wanted our newspaper to feel like a continuation of the town that was depicted by Keith — right down to having consistency in the way that street numbers were assigned and phone numbers allocated. The result of that research was a series of reference indices which we used extensively when writing newspaper copy for our product (as well as creating scenarios). 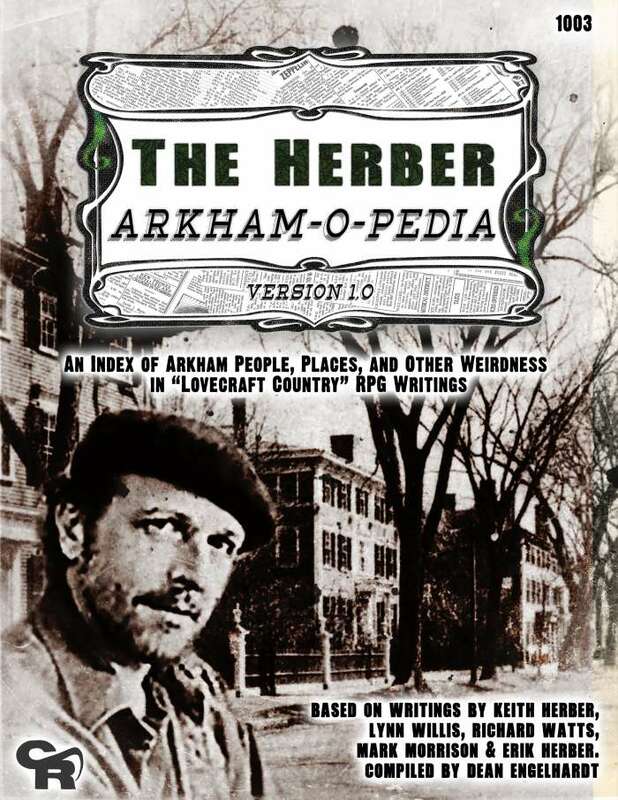 Because we figured that some other writers might also find it handy, we also released it as a free book: The Herber Arkham-O-Pedia. Our intention was always to publish add-ons which provided some fleshed-out scenarios that tie-in with items which appear in the newspaper (which can serve as ready-made scenario handouts). The model we’d ideally like to build is one where the Dateline: Lovecraft product line is profitable enough that we can use its revenue to commission writers and illustrators to make these scenarios for us. As an illustration of what the scenario releases might look like, we provided one as a free/PWYW supplement released at the same time as the core product. That first supplement was by Jo Kreil and titled “Help Wanted.” It is an Arkham-based scenario which sees the Investigators looking into a series of strange classified ads that have appeared in recent issues of the Arkham Advertiser. These “help wanted” ads all follow a similar format, each calling for an oddly-specific and unusual skill that the applicant must have. Each runs for just a few issues — until someone responds — and then disappears. So too do the people who respond to the ad. 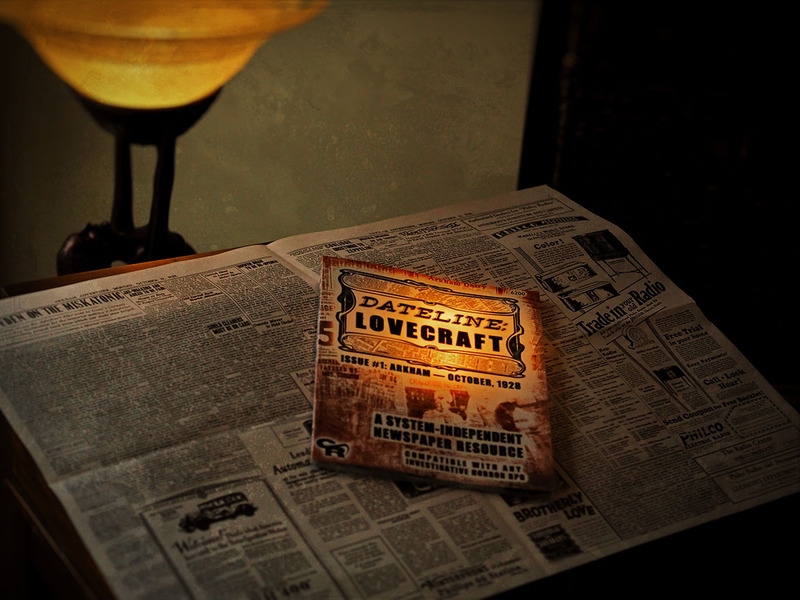 Just a week or so back, we shared a photo of some experimental physical versions of the Dateline: Lovecraft newspaper that we had printed in the U.K. We will be looking into how we we can get some of these into the hands of the (many) people who have said they might like one. Based on overwhelming feedback from the poll we posted earlier, we’ll also be looking to bundle these with a 96 page physical book which reproduces most of the content of the guidebook PDF *and* the first two scenario add-ons (“Help Wanted” and “Smoke Green!”). That wraps up the summary of all the products we have managed to release in 2018. However, it’s not the full story of what Cthulhu Reborn has been working on. There are other projects bubbling away with different writers and collaborators, which will hopefully bear fruit in the coming year. One project which we released a little bit of information about (back in June) is APOCTHULHU, a book of post-Apocalypse scenarios each set after a different version of the Lovecraftian “apocalypse.” Over the past year we’ve had seven awesome writers working away on scenarios, and most have now turned in their scenarios for editing and revisions. That hopefully means we should have some Apocalyptic news to share in the early parts of 2019! In the meantime, though, we hope that all our readers have had a satisfying 2018 … and have enjoyed our humble efforts to produce products to enhance your games. We look forward to continuing to bring you high-quality and affordable (and above all, cool) things of a Lovecraftian nature in 2019! It’s gonna be a HORROR-filled new year (but in a good way). Best wishes to all! The Arkham Advertiser In Your Hands? 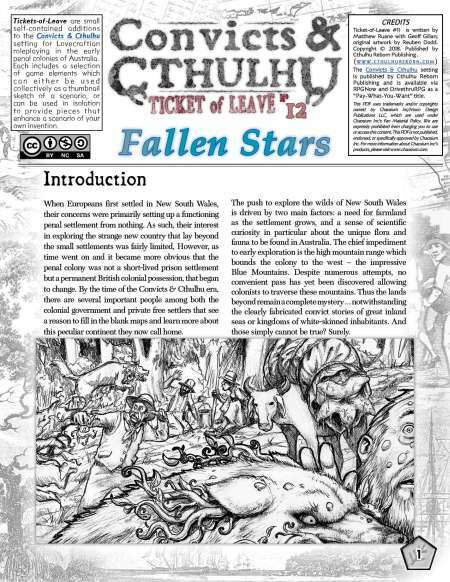 As most readers of this blog would be well aware, back in September Cthulhu Reborn published a newspaper-themed (system independent) product called Dateline: Lovecraft. Central to this product was a huge and realistically-rendered broadsheet newspaper — an entire issue of the Arkham Advertiser for the day of October 15, 1928. The basic idea of the product is that buried amongst the mundane news of the day — and often buried *within* that news — there are lots of weird little details that an enterprising GM could spin off into a plot point for a scenario of their making. Or gamers could just use the newspaper as a piece of period flavour to help establish Arkham as a unique “character” in its own right. Until now, Dateline: Lovecraft has existed only as a virtual product — when you buy it from DrivethruRPG you get two PDFs: one containing the broadsheet newspaper itself, the other serving as a guidebook with helpful indices, campaign ideas, and a ready-to-run scenario. 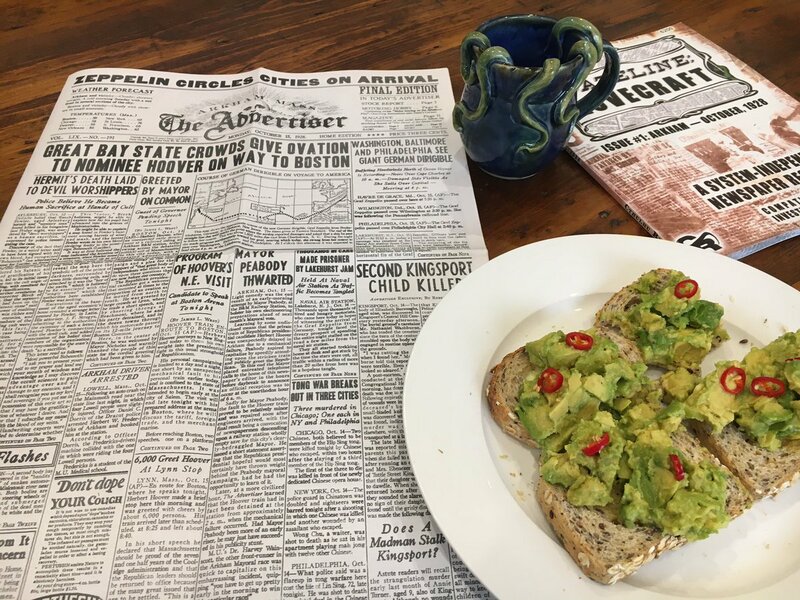 Perhaps the most common piece of feedback we’ve received about this product is that yes, it is a very cool virtual newspaper, but wouldn’t it be so much cooler if you had the newspaper in printed form? We like this idea a lot, and have been looking into what it might take to get such a thing printed on realistic newsprint for an affordable cost. Believe it or not there are not that many printers who will print giant broadsheet newspapers like this, especially in low volumes. But … we found one such printer and had a small test print run made up. 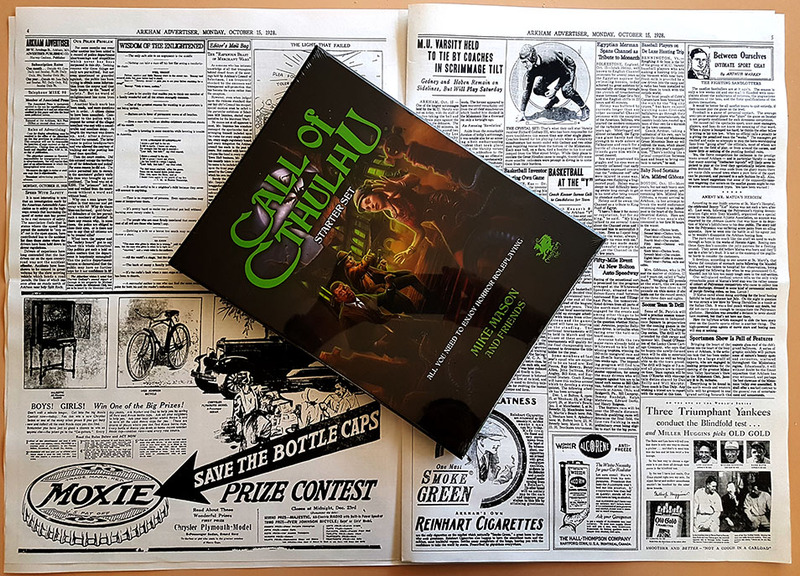 We think the test prints look pretty awesome (pic below shows one with a recent Cthulhu box set from Chaosium, as a size comparison — the Chaosium product is itself slightly bigger than US Letter size). On the subject of the second free/PWYW Dateline EXTRA scenario … we are getting perilously close to the point where the profits from sales of the current Dateline: Lovecraft PDFs crosses the threshold we set to release this new PDF. All we need is to sell a couple of extra copies of the Dateline PDF (or have a generous benefactor drop by our donations page and throw some Christmas miracle dollars our way) and this will go into layout for immediate release. 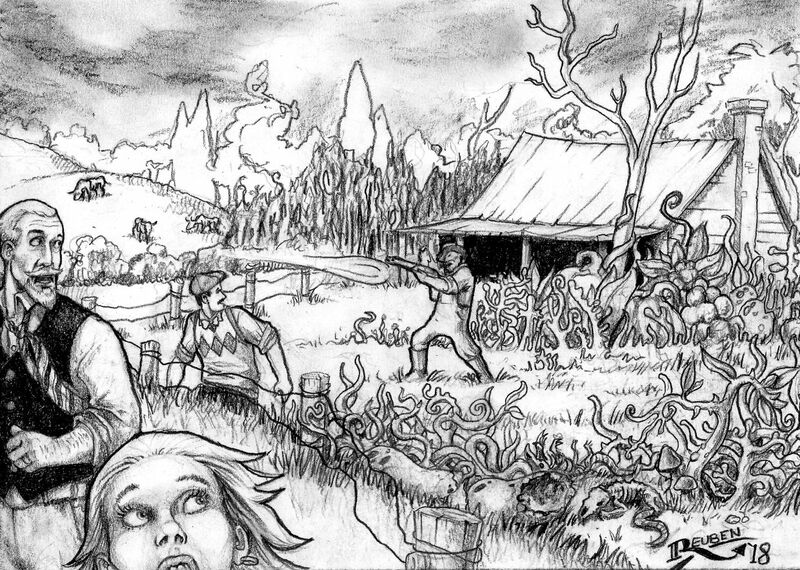 The scenario itself, by the talented Noah Lloyd (of ReckoningOfTheDead fame) is already written and mostly illustrated, so once the funding total is hit we hope to get it released within a short time — probably just a few days.